It’s been a bit since I have posted, but with good reason. 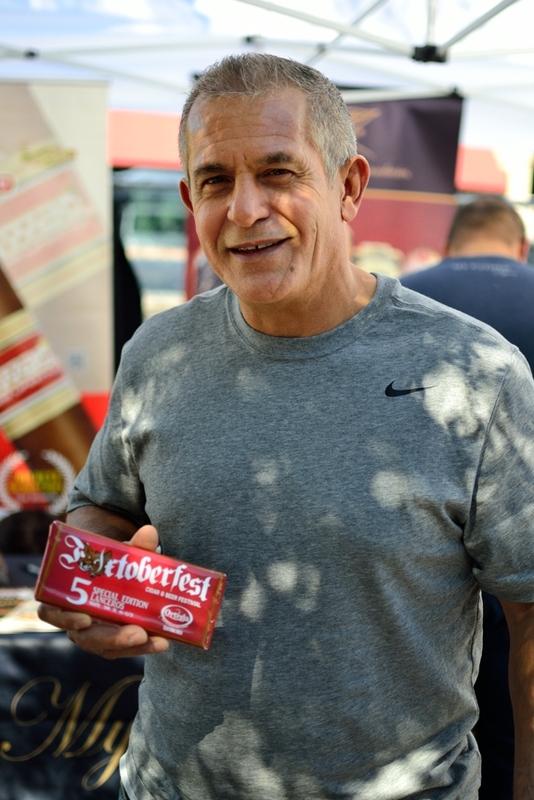 As some of you know, Jeremy and I ventured out to Phoenix, Arizona for Fox Cigar Bar’s annual “FoxToberfest” Beer and Cigar festival. While we had a blast, we also got quite a bit of coverage from the event done. 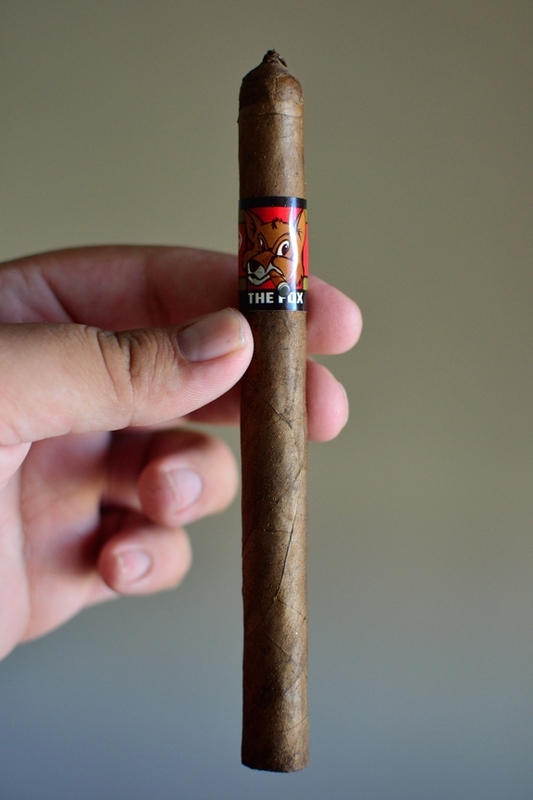 Expect that post later this week, but in the meantime I bring you one of the event-exclusive releases, Ortega Cigar Company’s “The Fox”. The Good Stuff: Eddie took on a huge feat when he decided he wanted to release the Wild Bunch series this year. 12 blends, in 12 months. That’s nuts, but Eddie pulled it off. Maybe he got bored, or maybe he just loves Cliff and the staff at Fox Cigar Bar. Whatever the case may be he decided to throw out another blend this year producing “The Fox”, an event specific blend for Fox Cigar Bar’s FoxToberfest. This is a huge event into it’s second year for Fox Cigar Bar. 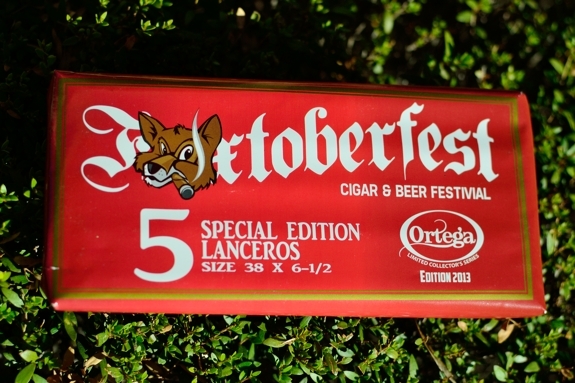 Many manufactures and staff headed out this year to pay a visit including Eddie Ortega from Ortega Cigar Company, Jose Ortega from My Father, Jesus Fuego from J Fuego Cigars, Matt Booth from 101, Nish Patel from Rocky Patel, Fabian Ziegler from Drew Estate, Tony Gomez from La Flor Dominicana, Rafael Alejandro from Boutique Blends, Wes Thornton from the Crowned Heads, Clint Aaron from 262 Cigars, David Fraser from Xikar, Meera Levin from Ashton, Terence Reilly from Sag, Jeff Nolen from Oliva Cigars, and Glen Loope from CRA. We’ll have more on the event later this week. Eddie was one of the manufacturers who created a blend specific for the event (Along with Rafael who created a Swag blend, and LFD). This isn’t just a spin off of any of his other blends, The Fox was created as it’s own blend completely separate for anything Eddie was already doing. I don’t have the specifics of the blend at this time, but I will update this post as they become available to me. While this was slotted to be a limited release with only a handful of 5 packs produced, Cliff let me know that Fox Cigar Bar has since secured the blend and are looking on even extended the line in the future. What does this mean? 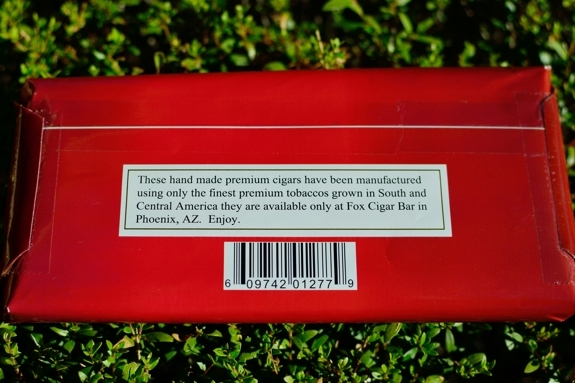 Simply put, you can still get your hands on them, but only from Fox Cigar Bar. They may still have a few on hand, with more on the way. They run $39.99 per 5-pack and you can get yours by contact Fox Cigar Bar directly via email, Facebook, twitter, or by simply walking in the store. Prelight: Ortega’s Fox starts off with a beautiful, dark brown wrapper. 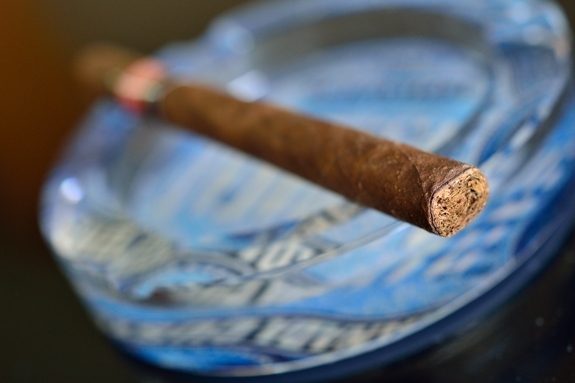 The wrapper showcases some darker webbing areas in the leaf as it seamlessly leads up to the cigars round, tailed cap. I love these little tails on the caps of corona/Lancero cigars. Adds so much character. Anywho, the cigar is very slim and slender so I was a bit worried about compressing it to see the strength of the tobacco, but the Fox holds it own and is actually incredibly firm to the touch. The wrapper is very thick and toothy. 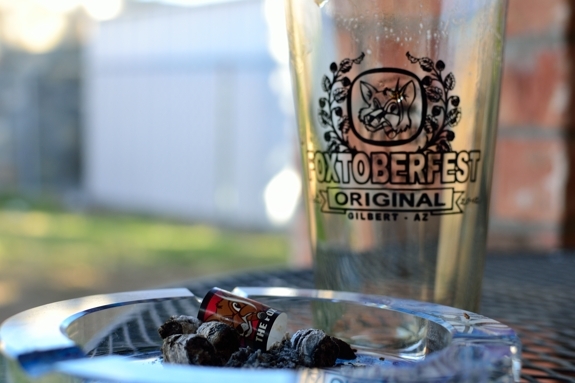 The cigar is polished off with a “Wild Bunch” style logo showcasing Fox Cigar Bar’s infamous Fox logo along with white words printed on the back: “FoxToberfest 2013 Cigar & Beer Festival Limited Edition Fox Cigar Bar”. Good stuff. The Fox gives off lots of spice and chocolate aromas from the wrapper and a nice blast of pepper and spice from the foot. The Cap cut clean and easily using my double bladed Palio cutter. The cold draw produces a really sweet, leathery, syrupy draw. I get a bit of the black pepper from that as well. 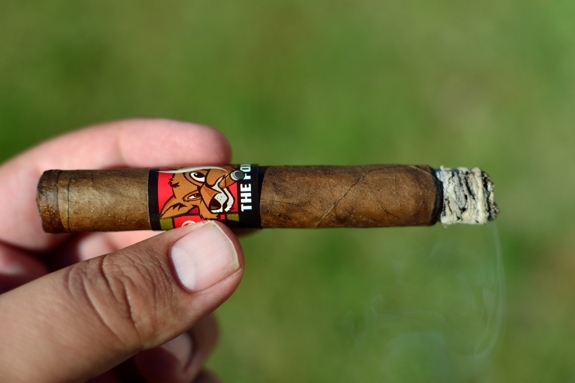 First Smoke: The Fox leads off with a nice blast of black pepper which quickly faded away after the first few draws leaving behind lots of dark chocolate, syrup, natural tobacco flavors with a real neat floral aftertaste. The draw is just a bit tight, but nothing too concerning. In fact, I smoked three of these and all had a flawless draw except for this one. Anywho, it’s not plugged and really isn’t giving me much trouble so I’ll move on. The burnline is dead even and razor sharp leaving behind a brilliant trail of white and light gray ash which held on for only about ¾ of an inch before falling into my ashtray. Halfway There: The chocolate has really started to pour out of Ortega’s “The Fox” into the second third. Most of the spice and pepper has dropped out and the cigar is burning with lots of sweetness, chocolate, espresso and still a bit of those floral notes I picked up in the first third. I am also happy to report after about the first inch the draw completely opened up and has been pumping out a ton of thick, smoke ever since. The retrohale on the Fox is actually quite satisfying coating my nasal passage with just a ton of chocolate and even a bit of cedar. The burnline is still dead even and razor sharp while I am feeling absolutely no nicotine at this point. Finish: The Fox has began to mellow out and finished off with a creamy mixture of coffee and chocolate. The floral flavors have diminished and I can only pick up the spice on the aftertaste. 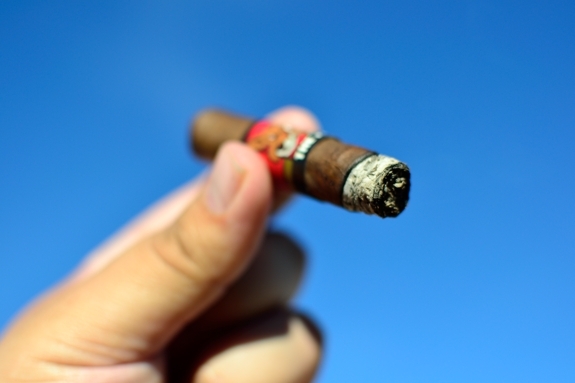 Usually I tend to smoke Lancero faster than most vitolas leading towards some harshness built up here and there, but that wasn’t the case in any of the Foxes I smoked. Each one finished off very smooth and creamy leaving behind absolutely no feeling of nicotine. It took me about an hour and a half to take this one down to the nub. 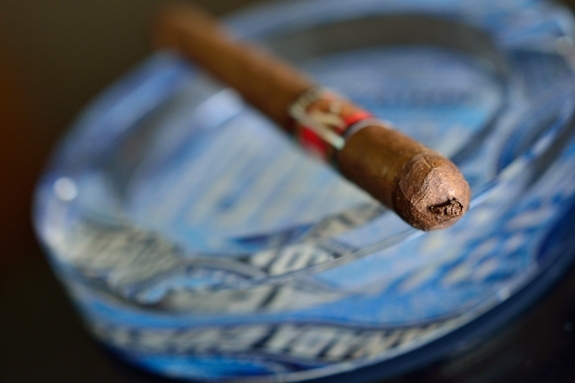 Overview: It’s easy to see why Cliff was so excited to introduce “The Fox” to the cigar world. Eddie created yet another masterpiece. First off, I love the size, but that’s no secret. I’m a corona, Lonsdale, Lancero guy. But the blend itself is just great. Leading off with a bit of black pepper and spice, balanced out with a ton of sweetness, coffee, and chocolate before finishing off with lots of creamy, earth notes. Great experience all around. Add in a fantastic price point, the great people at Fox Cigar Bar and 5pk packaging vs. full boxes and you got a winner. 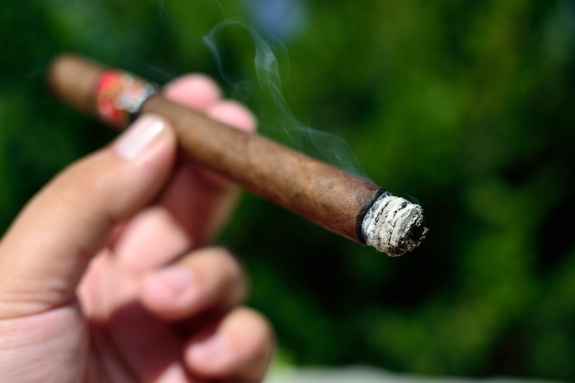 I would contact Fox Cigar Bar ASAP and get a few if you’re a fan of flavorful, balance, cigars. Or just a fan of Eddie’s work in general. Pairing: I found the perfect pairing for The Fox. 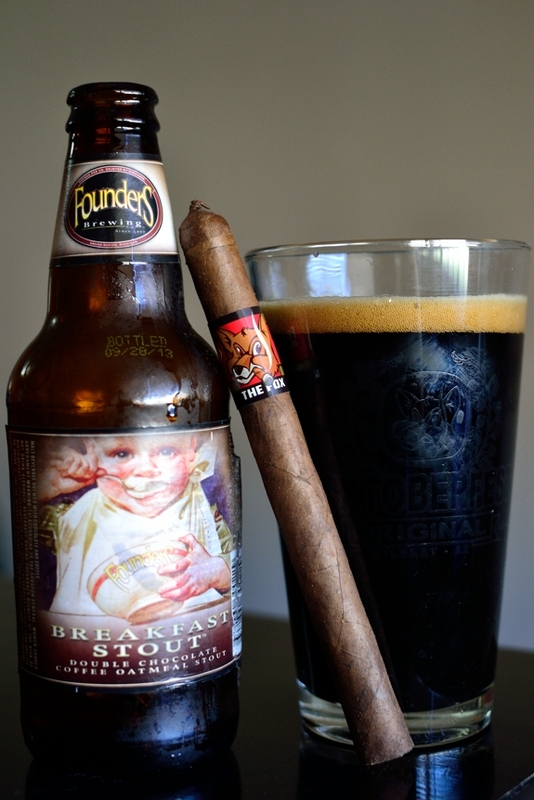 Founders Brewing Breakfast Stout. It’s a double chocolate, coffee, oatmeal Imperial stout. Seriously, read that again. 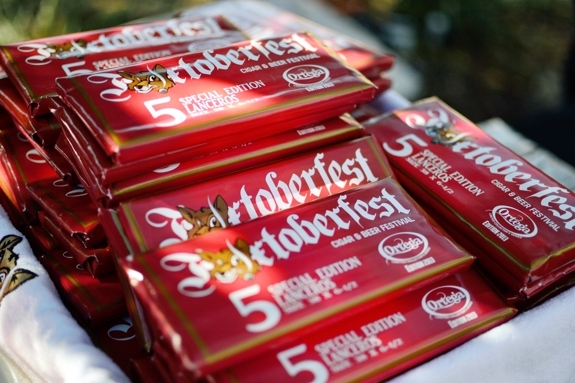 Without even drinking the beer can you see why it’s a perfect pairing? Brewed at the Founders Brewery in Michigan this Imperial stout comes in at a whopping 8.3% ABV. So, we got chocolate, coffee, oatmeal, and high ABV? SOLD! Seriously it’s just as good as it sounds leading with a ton of chocolate with just a bit of coffee on the finish. Lots of malt, and caramel fill the gap in between the two dominant flavors making as close to a perfect stout as you can get. Now add the sweetness, coffee, and chocolate from Ortega’s Fox and you have a perfect, all-round balanced pairing. Mmmm…. that would make for one helll of a breakfast. Nice to know that they will still be available in the future. Haha, maybe for Thanksgiving? I tend to get started early that day.